Album number six for the Finnish grinders sees them continuing in much the same line as 2008’s rather good Cycles. The sludge-imbued, doomier sound continues to gain weight and traction as the sixteen tracks here prove, Cursed being a muscular beatdown moving slowly away from the pit and towards the swamp. 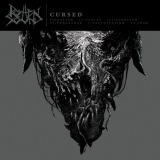 Rotten Sound have truly slowed their roll here, the themes of isolation and despair never sounding so intense, delivered through short but sharp shocks with single-word titles – Alone, Superior, Hollow, Exploit, and so on. It’s a decent set-up that when cherry-picked can sound rather dull and boring track by track, but once you’ve listened to the album as a whole, marvellously impressive. Whatever you want from grind, chaotic violence, meandering atmospheric churn, wailing guitar solos or punkish catchiness, it’s all there, and all performed wonderfully. A host of guests add spice to various tracks, from Misery Index’s Jason Netherton to the one and only LG Petrov, his bark giving Superior and Choose a distinctly Swedish death feel – yet all fit in perfectly and enhance what’s there rather than making it stand out from the crowd. The album as a whole flows wonderfully, often not letting you notice that tracks have finished but running them seamlessly together – like the best grind, this is over before you know it. Opening triptych Alone, Superior, and Self especially might as well be a single track, flowing almost without pause before the ominous rumble of Choose breaks the pattern. Green, Machinery, Power and Plan form a similar grouping – whether done deliberately or not, that’s the effect it seems to have, and that’s more than praiseworthy considering most grind bands are content with much less. Fortunately, Rotten Sound demand more, and each member of the band deserve plaudits for their contribution. Vocalist G’s harsh growl has gotten more intense and spine-tingling with each album, and Cursed shows him at the height of his powers, the likes of Declare genuinely terrifying. Drummer Sami Latva, meanwhile, continues to impress by enhancing his technical battery with carefully-considered forays away from grind territory, hardly notably unless you’re listening for them. And of course, guitarist Q leads the pack with the best set of riffs this side of Pig Destroyer. Aside from them and Napalm Death, it’s hard to think of another band that sums up 21st century grind so perfectly – that Rotten Sound belong in such exalted company is beyond indisputable. Pig Destroyer’s follow-up to the less than perfect Phantom Limb will have to be very good to beat this.